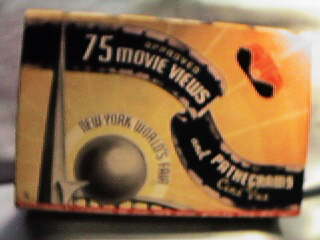 Item#WF48: 1939 NEW YORK WORLD'S FAIR PINBACK Celluloid pinback features an airplane and the Trylon and Perisphere. 1.25 inches in diameter. SOLD . 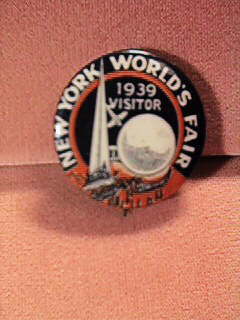 Item#WF49: 1939 NEW YORK WORLD'S FAIR PINBACK Same as above, but contains the word "Visitor". SOLD . 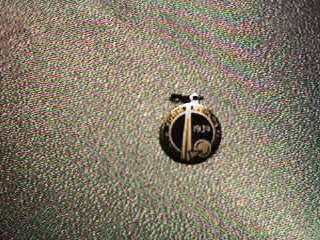 Item#WF93: 1939 NEW YORK WORLD'S FAIR "FRATERNITY" PIN This small brass pin, with a chain has an attached "39". It features the Trylon and Perisphere and sun with rays. .5 inch in diameter. Mint condition. SOLD . 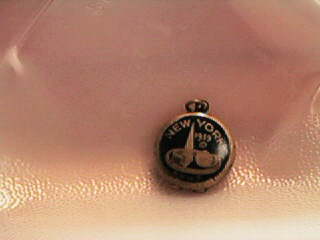 Item#WF87: 1939 NEW YORK WORLD'S FAIR LOCKET. A lovely little thing, .75 inches in diameter, with a loop for hanging. Hinged at the bottom, it opens to reveal space for two photographs. The front features the Trylon and Perisphere, and the back is engraved, with a space to put an initial or two. Excellent condition. SOLD. 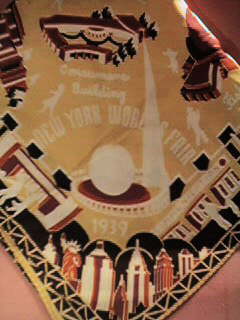 Item#WF79: 1939 NEW YORK WORLD'S FAIR SCARF Yellow background with brown trim and scenes from The Fair. 18 inches square. A spot of dirt or two; needs dry cleaning. Suitable for framing. SOLD . 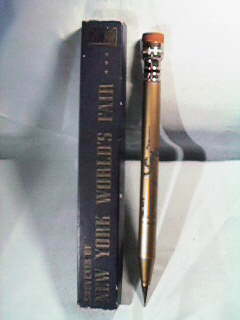 Item#WF75: 1939 NEW YORK WORLD'S FAIR ENORMOUS MECHANICAL PENCIL Here's an unusual item, put out by the Eagle Pencil Co. It's a rather large (10.5 inches long, .75 inch diameter) mechanical pencil, with lead and eraser, and a picture of the Trylon and Perisphere with a man and woman climbing on them. The pencil is in near-mint condition (the rubber eraser has hardened). The box is not so lucky. All four corners have been taped and someone has written on the inside.Box says, "Souvenir of New York World's Fair and feaures the T&P. SOLD. 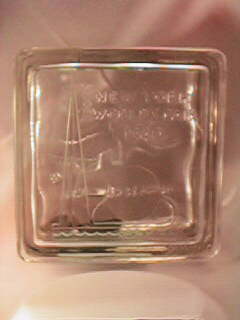 Item#WF69: 1940 NEW YORK WORLD'S FAIR GLASS BLOCK BANK This is nearly impossible to photograph. It's a much smaller version of the large square glass block bank put out by Esso (and by the way, we have two of those. If you are interested in one, email us for more information). This one is from The Glass Center at the Fair. It measures a mere 3 inches by 3 inches by 2.75 inches deep. It doesn't have a crack near the slot like so many others, and we found out why. On the bottom is a label that reads, "To open wrap towel around bank - insert screw driver or wedge in slot - then tap lightly". This has never been tapped. It is in absolutely perfect condition, and has the Trylon and Perisphere on one side, and the Glass Center on the other.SOLD . 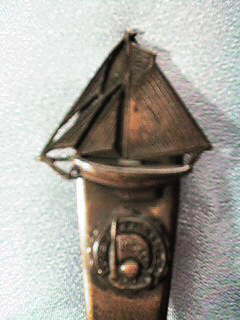 Item#WF204: 1939 NEW YORK WORLD'S FAIR MOTHER OF PEARL PIN. 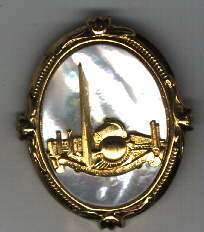 Brass-colored metal with a mother-of-pearl plaque, featuring goldtone Trylon and Perisphere in relief. 1.75 inches high. Excellent condition. SOLD. 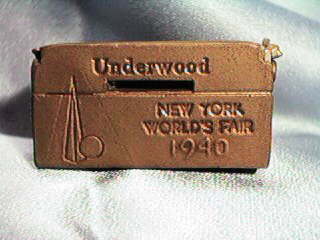 Item#WF212: 1939 NEW YORK WORLD'S FAIR UNDERWOOD TYPEWRITER BANK. 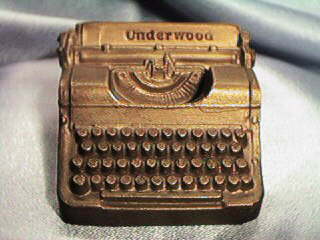 Wonderful brass-finished metal bank, shaped lilke a trypewriter. 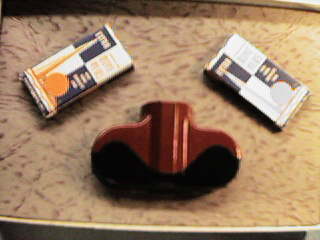 It says "Underwood" on the carriage. 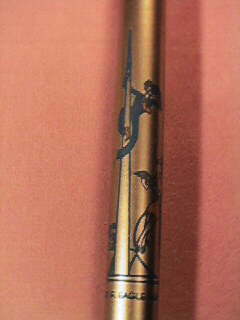 Measures 2.5 by 2.5 by 1.5 inches high. The BACK says , "Underwood, New York World's Fair 1940." Condition is near mint.SOLD. 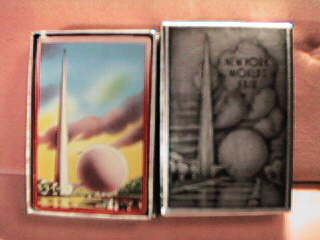 Item#WF96: 1939 NEW YORK WORLD'S FAIR MOTHER OF PEARL PIN. Deco silvertone frame holds mother of pearl slab with Trylon and Perisphere decal. Photo magnified to show slight imperfection at edge of decal. 1 inch wide, decal is red, blue and gold.SOLD. 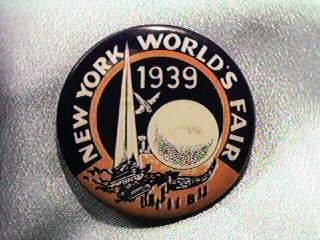 Item#WF72: 1939 NEW YORK WORLD'S FAIR ENAMEL PIN WITH CHAIN. Tiny lapel pin feaures orange and blue enamel with Trylon and Perisphere, and looped chain. 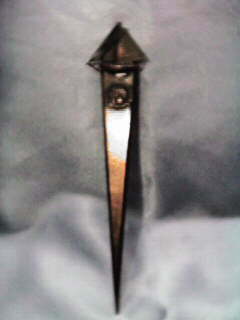 Pin is one inch high and in excellent condition. 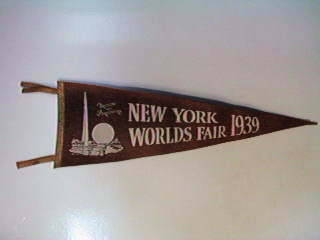 Says "1939 World's Fair NY" . SOLD. 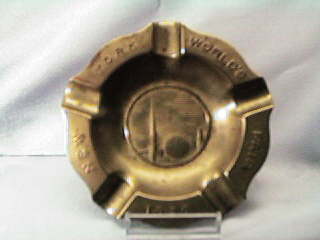 Item#WF120: 1939 NEW YORK WORLD'S FAIR ASHTRAY. 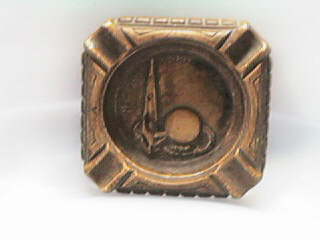 Small ashtray made of Syrocco wood. Features Trylon and Perisphere in the center. 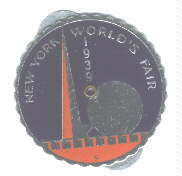 Says "New York World's Fair". Excellent condition. SOLD. 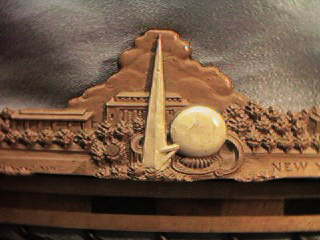 Item#WF90: 1939 NEW YORK WORLD'S FAIR PLATE. 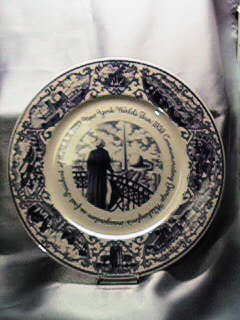 Made by Lamberton Scammell, this plate features a Trylon and Perisphere on the back, with "Official Souvenir, New York World's Fair 1939". The front shows George Washington on a balcony overlooking the Fair, with the Trylon, Perisphere and reflecting pool in the background. Rim is decorated with scenes from the fair and the writing, "New York World's Fair 1939. Commemorating George Washington's inauguration as first President of the U.S. A. 1789. Condition is perfect. SOLD. Item#WF16: 1939 NEW YORK WORLD'S FAIR TIE BAR. It was impossible to get a close-up shot of the whole thing at once. Click HERE to see a long view. This tie bar is made of wood with a Syrocco Wood decorative front. It measures 17.5 inches wide and 3 inches high at the top of the Trylon. It has 15 hooks for ties (or belts or scarves or necklaces or shirts etc) and is in near mint condition. A very handsome piece for display. SOLD. 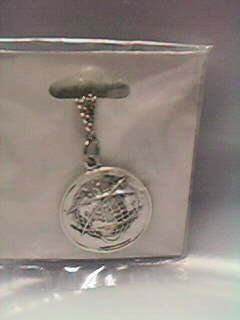 Item#WF64: 1939 NEW YORK WORLD'S FAIR BOOK CHARM. 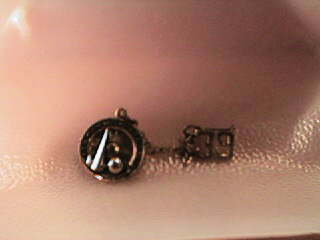 Tiny brass charm is a book with Trylon and Perisphere on the front. It opens to reveal a series of color pictures of scenes from the Fair. 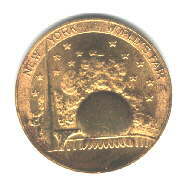 Inside back cover, it says, "NYWF License 1625". .6 inches high. Very good condition. SOLD. Item#WF38: 1939 NEW YORK WORLD'S FAIR COPELAND SPODE PLATE. This fabulous 10.5 inch diameter blue on white plate, depicting the Hall of Production, features the Trylon and Perisphere at the top, and symbols of the industrial world all around. In the center is a depiction of the Hall of Progress. 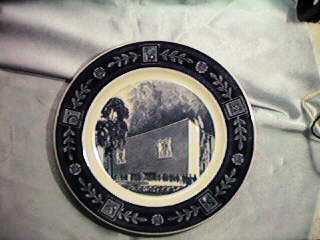 However, the plate was commissioned and produced in 1938, working from architect's renderings of the buildings. By the time the Fair opened, there was no such building. So this is a picture of a building that never was! Made by Copeland Spode of England. Pristine condition. SOLD. 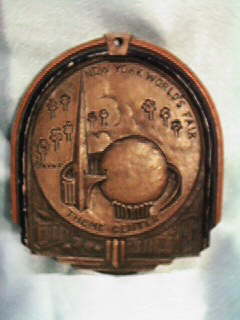 Item#WF40: 1939 NEW YORK WORLD'S FAIR PLAQUE. 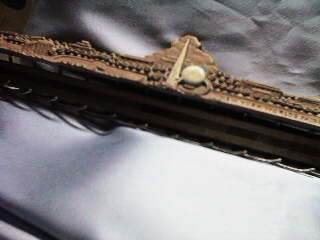 This small plaque (4.25 inches high) is made of Syroco wood. It has a hole for hanging, a blue and orange border, and the Theme Center, along with the Trylon and Perisphere in relief. Syroco label on back. Some wear to dark blue border, otherwise excellent condition. SOLD.